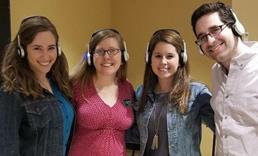 Recently Springhouse’s Therapeutic Program Coordinator, Meredith Griffiths, had the pleasure of meeting with several new team members from Eversound to showcase how their headphone system has enhanced resident engagement at Springhouse. Eversound is a wireless headphone system that helps users hear more clearly during presentations, movies or any other activity that involves audio. Inability to hear or to focus can be a significant impediment to some residents getting the full benefit of engagements or activities. Eversound offers a simple way to overcome these common issues. Referred to as a Group Listening System (GLS), Eversound is specifically designed to help deliver sounds directly and without distraction into the ears of those with hearing deficiencies or who lack focus due to dementia. A simpler alternative to hearing aids, users wear a comfortable set of over-the-ear headphones that are connected wirelessly to a microphone or other audio source. In addition to being easy to use, here at Springhouse we’ve found that the Eversound headphones have been enjoyed by both residents without hearing loss, and those who use hearing aids, as they help to block out background noise. Currently the headphones are offered to participants for any program that makes use of our audio system. We encourage you to try them out on your next visit!